Tesla's Model S deviated from the green car mold by not looking like a green car, instead embracing a design that would be instantly recognizable as comely no matter the drivetrain. The original Volt followed the Prius in looking more like a concept of future transportation. I'd argue the new Volt is more attractive, with a more pleasing shape and softer details that include active grille shutters. Yes, it's still an "extended range hybrid electric vehicle" with a small gasoline engine to charge the batteries, but they've improved the range of the new battery pack to allow for an EPA-rated 50 miles which, compared to the 36 miles of the outgoing model, isn't half bad. 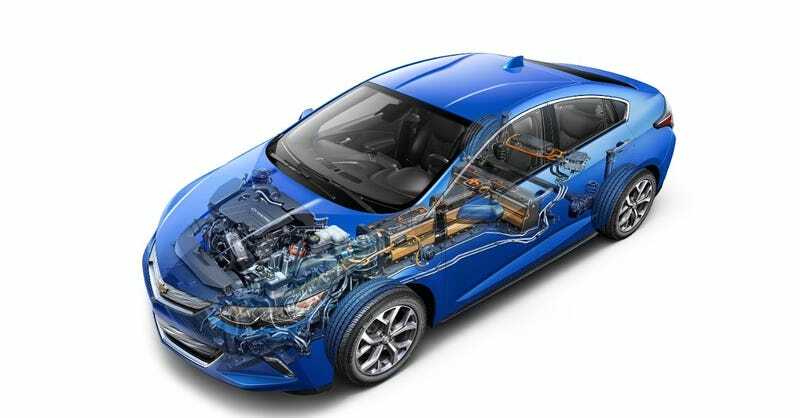 They say the average commuter drives 40 miles a day, giving the Volt a little extra room. Overall driving range increases to 420 miles on a full charge with a full tank of fuel, and economy increases to 41 MPG combined with 102 MPG-E. No price has been named, but if it's in the same general range as the current model it could prove slightly more competition for the Prius. Still, we're all curious about the Chevy Bolt.